The Postal Regulatory Commission (PRC or Commission) is an independent establishment of the executive branch of the federal government with regulatory oversight over the United States Postal Service (USPS or Postal Service). It is composed of five Commissioners supported by staff from its four operating offices, one of which is the Office of Accountability and Compliance (OAC). OAC is responsible for technical analysis and formulation of policy recommendations for the Commission in both domestic and international matters. The Postal Accountability and Enhancement Act of 2006 (PAEA), Pub. L. 109-435, 120 Stat. 3250-51, established the Retiree Health Benefit Fund (RHBF) to fund the long-term retiree health benefits for postal employees, retirees, and their survivors. Beginning in FY 2007 through FY 2016, the PAEA required the Postal Service to make specified annual payments into the RHBF. In FY 2017, the funding of the RHBF was changed by law to amortization of the unfunded obligation. The OPM revalued the FY 2016 RHBF unfunded liability at $56.9 billion and assessed an annual amortization payment of $955 million to liquidate the unfunded obligation by FY 2056 and a participant normal cost payment of $3.3 billion, both due September 30. 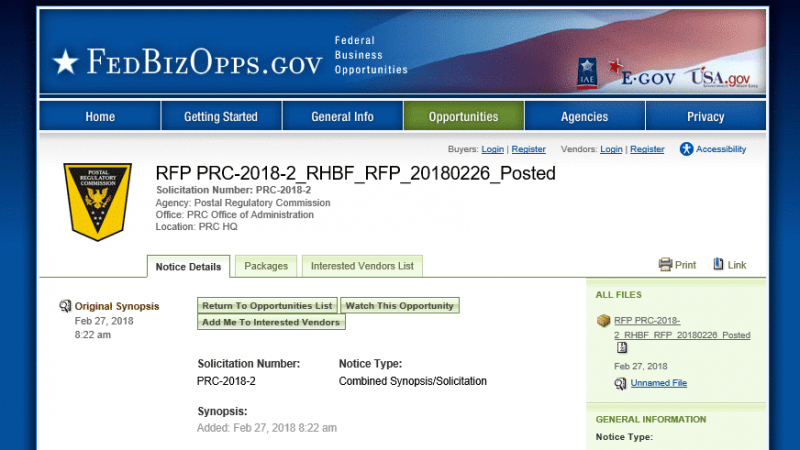 On January 30, 2018, the Postal Service filed a request under 5 U.S.C. § 8909a(d)(5)(A). The request is docketed at the Commission as Docket No. SS2018-2. 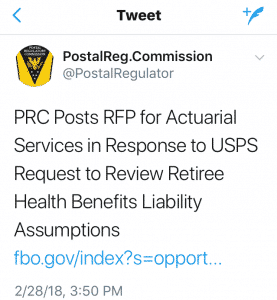 In its request, the Postal Service asks the Commission to examine the actuarial appropriateness and accuracy of OPM using government-wide assumptions rather than those specific to Postal Service employees and annuitants. It also observes that the propriety of full use of postal-specific assumptions has been recognized by the Postal Service’s OIG. The request seeks a Commission finding upon review and comment on an actuary’s report that: (1) it is appropriate and more accurate to use the postal-specific assumptions than the assumptions used by OPM in calculating the RHB liability and (2) that OPM should re-determine the unfunded liability using such assumptions. The Commission requires actuarial consultant services to review the appropriateness and accuracy of the current assumptions used by OPM for the determination of the Postal Service’s RHB liability. The actuarial consultant shall provide a report, documentation and deliverables in verbal, written or electronic format (as appropriate) and shall provide weekly written progress reports. Offerors are advised that the PRC will not pay for any information or administrative costs incurred in response to this RFP; all costs associated with responding to this RFP will be incurred solely at the interested party’s expense. The PRC reserves the right to contact any respondent to this notice for the sole purpose of enhancing PRC’s understanding of the responder’s proposal. The content of any responses to this RFP may be reflected in any subsequent solicitations. All information included in responses to this RFP is confidential and only for the use of the PRC. No information included in offeror proposals or in discussions connected to this RFP may be disclosed to any other party outside the PRC without the written consent of the offeror. The PRC is an independent agency that is part of the executive branch of the Federal government. The PRC has exercised regulatory oversight over the Postal Service since its creation by the Postal Reorganization Act of 1970, with expanded responsibilities under the Postal Accountability and Enhancement Act of 2006. The PRC is composed of five Commissioners, each of whom is appointed by the President and confirmed by the Senate for a term of six years. The PRC maintains an independent office for its Inspector General. OAC (39 CFR 3002.12) is responsible for technical analysis and formulation of policy recommendations for the PRC in both domestic and international matters. It provides the analytic support for PRC review of rate changes, negotiated service agreements, classifications of new products, post office closings, amendments to international postal treaties and conventions, among other issues. The General Counsel (39 CFR 3002.13) directs and coordinates the functions of the OGC and is directly responsible for the counseling and advisory services set forth in 39 CFR 3000.735-102. In accordance with 3001.8 of the rules of practice, the General Counsel does not appear as an attorney in hearings in any proceeding before the PRC and takes no part in the preparation of evidence or argument presented in such hearings. PAGR (39 CFR 3002.15) serves as the public face of the PRC. As such, it is the PRC’s primary resource in support of public outreach and education, media relations, and relationships with Congress, the United States Postal Service, and other government agencies. PAGR provides information for consumers and responds to their inquiries; informal complaints regarding individual rate and service inquiries are referred to the Consumer Advocate of the Postal Service. Public Affairs and Government Relations staff also works closely with members of Congress and their staff. OSA (39 CFR 3002.11) provides management and staff support to the PRC’s operational offices (including the Office of Inspector General), the PRC’s strategic plan, and various initiatives of the Executive Branch. OSA ensures that the PRC has the physical, financial, technological and human capital infrastructure needed to accomplish its mission. The effort led by OSA provides financial management, records management, administrative and organizational support, planning and human capital resources for the PRC. The Office of the Inspector General (OIG) was established in June, 2007, as required by an amendment to the Inspector General Act of 1978 included in the Postal Accountability and Enhancement Act of 2006 (Public Law 109-435 sec. 605). The Commission requires actuarial consultant services to review the appropriateness and accuracy of the current and prospective assumptions used by OPM for the determination of the Postal Service’s Postal Service’s RHB liability. Provide related supporting data and, to the extent practicable, models or descriptions thereof to PRC staff. Specific discussion of the benefits of using postal-specific assumptions from both the perspectives of the Postal Service and the government as a whole when determining the RHB liability. The ultimate goal of this project is to have an actuarial consultant service to review the appropriateness and accuracy of the current and prospective assumptions used by OPM for the determination of the Postal Service’s RHB liability. The actuarial consultant must be a member in good standing of the American Academy of Actuaries, have extensive experience in the retirement health benefits, and must have experience analyzing pension issues in a legal and legislative context. The actuarial consultant must disclose all current and previous work performed for USPS or any other federal agency. The actuarial consultant also must disclose any pending negotiations for professional engagements with USPS or other federal agencies, apart from this SOW. The actuarial consultant shall provide a description of qualifications, proposed work methods, an estimate of the length of time needed to complete the project, the total cost of the project, and the basis for the calculation. The actuarial consultant shall acknowledge that if selected to provide professional services pursuant to this SOW, all work will be conducted with the understanding that time is of the essence in meeting the contractual deadline and that no extension of the deadline will be allowed. This section is the deliverable guideline for this project. At this time, we anticipate a work plan to include all the items listed below. However, the vendor’s work/task plan to implement the scope of work is at the discretion of the vendor and should be included as part of your capabilities. Acceptance of the proposed deliverables is subject to the approval of the Commission. Oral briefing must include presentation slides. Shall be available to assist the Commission in addressing comments on the consultants report prior to Contract Close Date (Estimated 30 September 2018). This entry was posted in General Union Business, Postal Reform and Politics, Retiree Business and tagged actuarial consultant, FEHB annuitants, PAEA, Postal Accountability and Enhancement Act of 2006, Postal Regulatory Commission (PRC), postal retiree health benefits, postal-specific assumptions, Request for Proposal, Retiree Health Benefit Fund, RFP, RHBF. Bookmark the permalink.